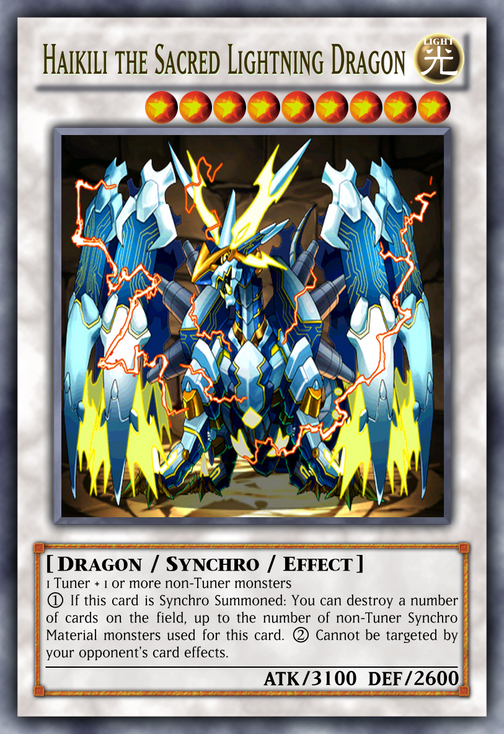 ① If this card is Synchro Summoned: You can destroy a number of cards on the field, up to the number of non-Tuner Synchro Material monsters used for this card. ② Cannot be targeted by your opponent's card effects. It should be no surprise that this is another post milestone (yes, I actually make sure that these posts are worth it). For this one, I had a variety of ideas I would've liked to do, but lack of images and ideas to go along with it. As a result, I ended up making a lightning dragon for my 31,000th. In terms of flavor notes, Haikili is the god of thunder in Hawaiian mythology, hence my naming of this card after him (well, it makes sense that a lightning dragon is named for a deity that embodies it). I was going to use a longer title for the name in Hawaiian, but then it'd look really awkward/repetitive (and I have a very limited understanding of Hawaiian sentence structure / vocabulary), so opted not to. As usual, I designed this card to be a generic Extra Deck boss for Decks that can afford to make Level 10 Synchros easily. Originally wanted to make this a Level 9, but because Blue-Eyes is a thing right now (I'm looking at you, Spirit Dragon / Azure-Eyes spam), I am not giving them a 3100 stat toy to blow up stuff with. (To be fair, they can still SS it via Spirit, but it won't do them much). As such, I rose it to Level 10, but the materials are generic. First effect is pretty much Junk Destroyer's on a larger generic body, but I wanted to reflect the nature of lightning in this card, and that was the inspiration for it. Second is standard boss protection; give it some protection so you don't invest resources in something that's going to be blown up quickly. Yeah, you can still Solemn Notice / negate its summon, or resort to sweep removal/battle destruction to remove it. A reminder that it's not protected by its third effect. I initially gave it a third effect which would've let you banish a card in the Graveyard to protect other monsters you control from destruction ("If another monster you control would be destroyed: You can banish 1 card in your Graveyard instead"), but leaving it off because I think that would've been too much. At the same time, it would've been a way to be unique as opposed to a stronger/generic Junk Destroyer that can't be targeted. As I made the requirements generic, most Decks should be able to make this without too many issues. At minimum, you should be able to blow up 2 cards, which isn't too bad, considering it also gets around targeting protection that common bosses tend to have nowadays. Image is from Puzzles & Dragons; found here. Alright then, think I said everything that I needed to; CnC please. Properly written reviews will be given reps.
Edited by Sakura Haruno, 17 October 2016 - 01:49 PM. Well, put in perspective, this has just enough power to run over Dark Destroyer, Blue-Eyes bosses (well, barring them going into stuff like Cipher Blade [slightly stronger than this] and other 4Ks, but this can pop it on-summon if you need to). Oh and going back to the thing I said about why I made this card Level 10 b/c of Blue-Eyes; they technically CAN still make this, but it'll require them to ladder from Azure-Eyes / Spirit Dragon off another Tuner (if they can afford it). But in that sense, it's not an instant Synchro for them like their usual L9 plays are. I designed this card to be simple enough to use, but still effective enough to compete in the power creep. You can technically 2-mat this if you have high enough Levels, but most of the time, you'll probably be going 3 mats (maybe more, depending on the Deck). Haikili's stats or its Continuous Effect—something needs to change. I agree with Azuriena: this practically outclasses Leo, which isn't cool, and it should preferable for it to have a different effect to Leo so it fills a different niche and becomes an extra tool for the Synchro10 toolbox. Another option is playing with its material requirements: for instance 1 Tuner + 2 or more Non-Tuners, or 2 Tuners + non-Tuners makes it harder to set up than Leo, but rewards you with its extra kick. Yeah, I remembered Leo as the only other generic 2-mat Level 10 (well, minimum anyway). As I've said before, use the written text at the bottom of the card as opposed to the card pic itself.